With summer approaching and our fun summer plans in the preparation mode. When I say preparation I mean me thinking that if I am prepared now vacations and beach fun will happen now. Yes, I am dreaming of the beach. Is it weird to start packing for something that is a few months away? For those of you that are not familiar with me and my blog. I live in Wisconsin but grew up in San Diego, California. I was the quintessential beach bum, not owning a pair of anything but flip flop shoes, or a legit coat. I adore where we live but miss the sun, surf, beach, and water. So today, from the archives I am sharing this project from last year. 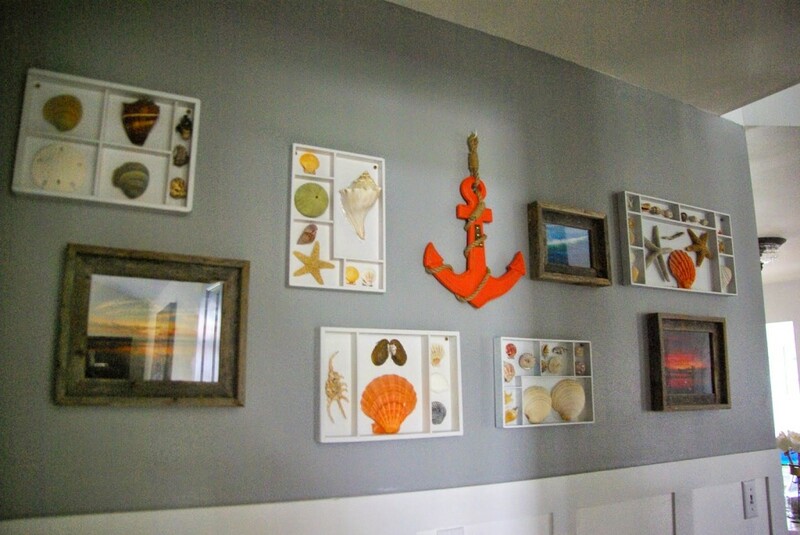 I made this coastal gallery wall from shells picked up at local stores in my home town or ones we found on the beach. This is a way for me to admire, remember and have a piece of where I grew up with me here in Wisconsin. I used these wood Melissa & Doug toy containers as the shadow boxes. These boxes were so cute, made so well, and we spent so much money on these little toys. Let’s get real here, these toy’s are pretty pricey. But so cute! I could not get rid of the containers. Dale wanted to throw them away in the recycle bin and call it a day. I explained “drop those boxes!” and he whisper/coughed “hoarder”. He can have his boxes of cables and model “toy” cars and I can have random boxes I might use. Except this time I was right. Which is really the point here. I used these containers as the gallery wall display. Whipped out my trusty hot glue gun. I am always armed and dangerous with ton’s of glue sticks. It was a quick and easy job. Just some spray paint and some gluing was needed. I set the boxes on the ground to see how the formation of them could fit. Making sure that it was somewhat even on both sides of the anchor. That was my one priority. With most gallery walls they work by keeping the sides “weighted” evenly. 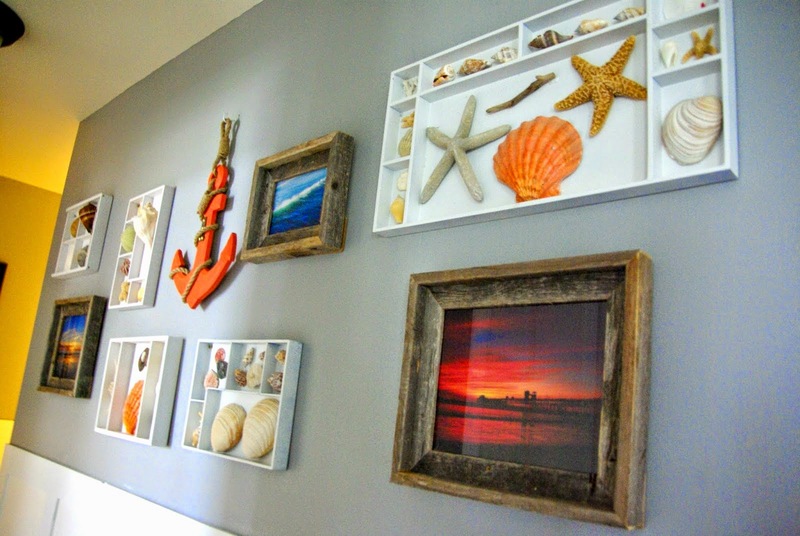 The pictures in the frame are from my go to beaches while out in San Diego. 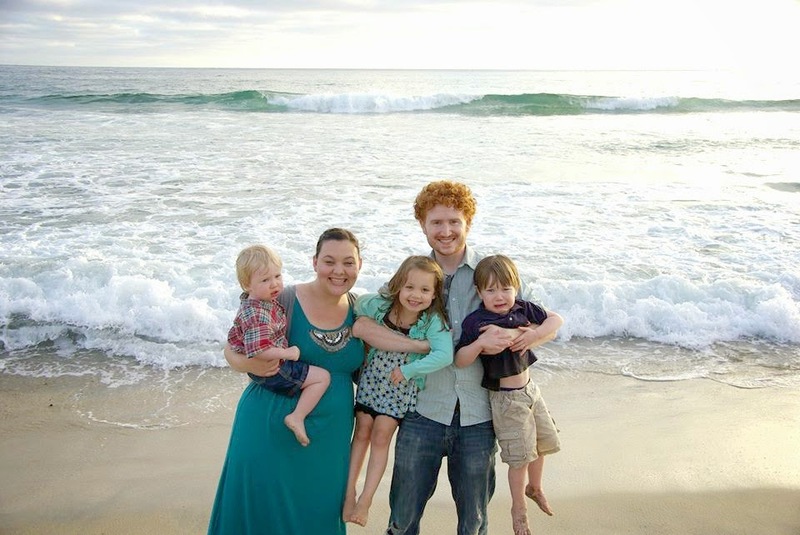 They were taken from a family friend who is really talented at taking beach and sunset pictures. I wanted to be sure to use pictures of places I went to. Place’s Dale, the kids and I visit once a year in California. This gallery wall is about my hometown, but also about the memories we have made together. The kid’s have asked me to tell them stories about the beaches in the picture, or what kind of shells are on the wall. 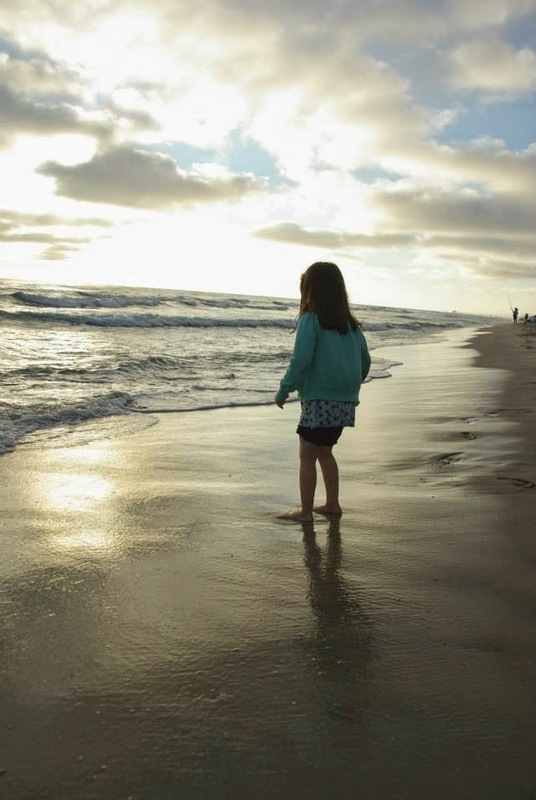 This was two years ago, on the beach in Oceanside California. Caleb is not a fan of the water, and this was as close as he went. Big fan of the sand though. I like making my house be as nice as possible. Obviously I am a big fan of home decorating. But, I am a even bigger fan of making the house work for the people in it. Not the visitors, parties, judging people, neighbors, whatever. This house is our home and this gallery wall is a way to bring my childhood home here to Wisconsin and bring up fun memories we have had as a family. That is what matters when decorating your home. Make it be for you, work for you. 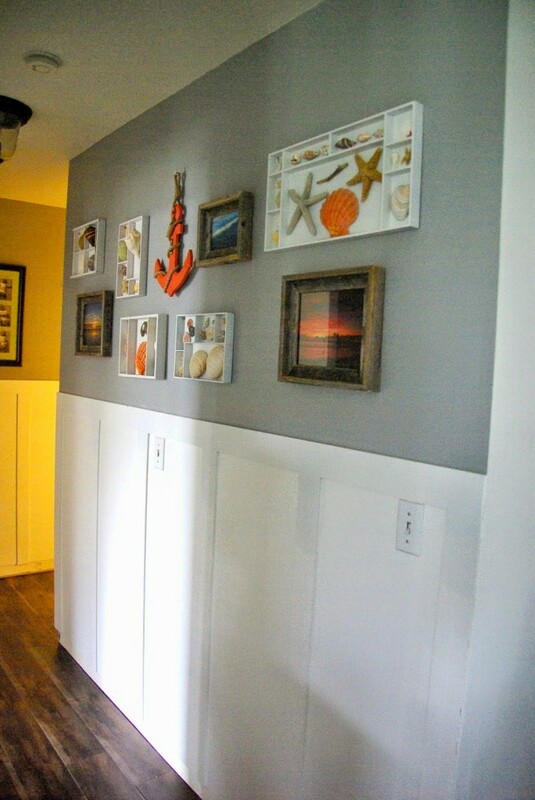 Projects like this are the best example of using what you have, putting in personal touches, and turning a random wall that is in the hallway into a special spot in our home. The full tutorial is here, it was a really simple and straight froward one. Do you live close to where you grew up? What are some things you have done in your home to make it special and personal for everyone? Am I the only one that thinks the best part about this project is the fact that I was right?!!!! This is a beautiful wall!! I love it. I have a large wall that has NOTHING on it. Thanks for the inspiration! Thank you! I am so happy that this got the creative juices flowing, good luck filling up your wall! Love this! Your wall looks beautiful. Wow, thank you so much! Once you get rolling with decorating, your mind cannot stop thinking of things to create. 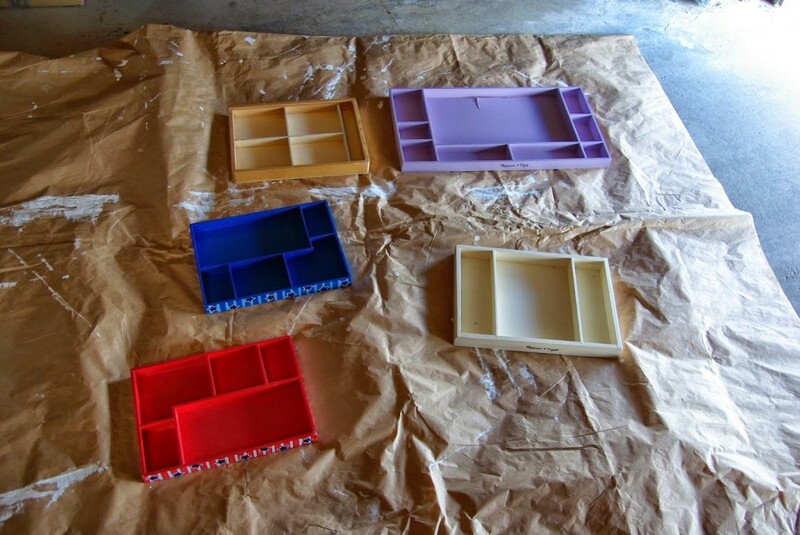 What a genius idea for those awesome Melissa and Doug trays! So smart! I definitely just had a "duh!" moment. I also love the bright pops of orange in the gallery wall, pretty! Thank you! Those trays are so cute and built so well I had to so something with them. 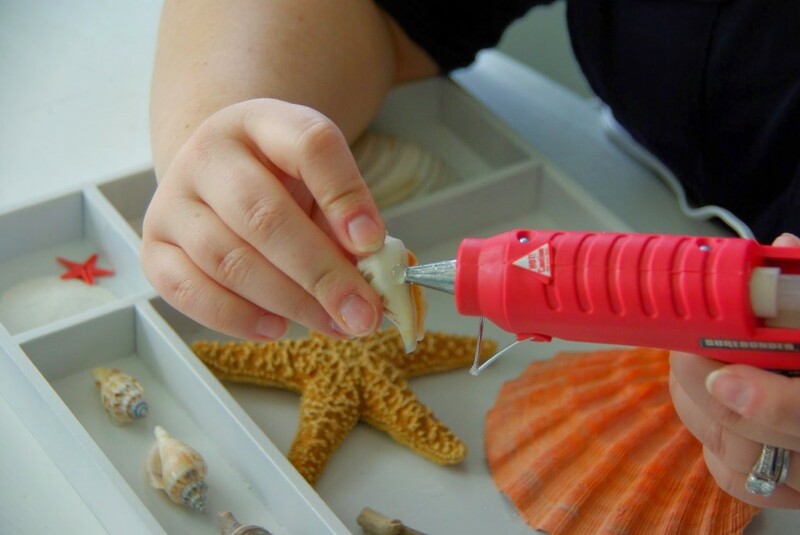 I should have my hubby do these for his shells. He collects sand from every beach we visit too. I was just collecting the shells and putting them in boxes or jars. I wanted to have my favorites out where I could see them. Putting them in a gallery wall is a great idea to actually enjoy the collection. Very pretty DIY! Love the shells you collected. Ah! I am so excited to hear of another Wisconsin blogger. There does not seem to be too many, at least that I have come across. Isn't it nice to finally be getting some none freezing temperatures around here? So cute! Great for memories! Thank you, it is great for memories! Ok this is brilliant, I've been trying to figure out what to do with our wood boxes! I am so happy you liked this can put it to use. Good luck with you own gallery wall! Just beautiful and I think it's lovely that you have a piece of your home there with you. I live in my home town, so all I have to do is look at the windows. 😉 Seriously, though, I wish I had your eye. My house burned down almost four years ago, so I lost all the pictures we had collected over 20 years. Starting from scratch is just paralyzing to me with the result that our walls are mostly blank. I am so sorry to hear about your home burning down, I can only imagine how terrible of a experience that is. I am sure it is hard to start making a new house feel like a home. I wish I could reach through the computer and give you a hug.